Update 8/19: The meeting broke up around 6:30, with everyone getting plenty of time to talk to Walz and Klobuchar before and after their brief remarks began. For us, the most moving part of the late afternoon event was meeting Vicky Sprenger of Sleepy Eye. As we noted beginning in 2007, her son Minnesota National Guard soldier B.J. Sprenger was badly burned in Iraq when a roadside IED detonated. The incident happened a day before his 22nd birthday. She talked to Senator Klobuchar about the family's experience with the military burn hospital in San Antonio, and showed us the tattoo she got there while B.J. was being treated. Congressman Walz knew the soldier from his own days in the National Guard. 6: 07 Congressman Walz talked about the work the House V.A. committee did and the bills that were passed. He talks about the experience B. J. Sprenger and his mother went through. He tells several stories and introduces his veterans outreach worker. He introduces Senator Klobuchar, who talks about the Beyond the Yellow Ribbon program. She introduces her outreach workers. She thanks Mrs. Sprenger and her family. 5:53 Senator Klobuchar, the District 2 commander for the VFW, and several other women are talking at a table. One is the mother of B.J. Sprenger. 5:39 The meeting is starting late since those at the Summit Center meeting in Mankato had a lot of questions.Senator Klobuchar and Congressman Walz are here, along with about fifteen vets and citizens, as well as assorted staffers, state representative Terry Morrow, and state senator Kathy Sheran. These meetings have been informal I've been told--those attending are taking advantage of the opportunity for face time with their U.S. Senator and Representative. 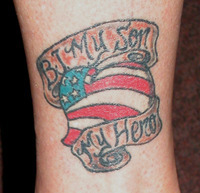 Photo: Vicki Sprenger's tattoo; photo taken at the St. Peter American Legion post. Note: Our last post from yesterday's live blogging was lost somehow, so we've added the update.